Join the venture capitalist crowd for some buckwheat pancakes at this Silicon Valley institution. : Much has been made of the venture capitalist clientele that frequents Buck's of Woodside, a carnival of a coffee shop in rural Woodside. 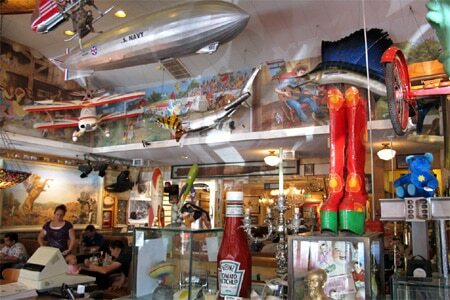 The walls and ceiling are festooned with tchotchkes, Americana and tech memorabilia that will keep you entertained as you eat. For breakfast, the buckwheat pancakes and egg dishes are safe bets. For a lunch or dinner, invest in a burger and a hot fudge sundae.